Performed by Anna Reider, violin Accompaniment: Plovdiv Philharmonic Orchestra Conductor: Nayden Todorov The great composer/virtuoso Henryk Wieniawski wrote this concerto in 1853, at the age of 18. But it reflects an astounding musical maturity. 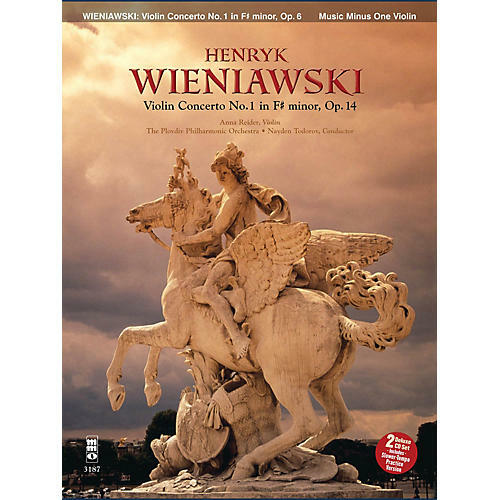 In particular, this concerto features a grand, theatrical air with plenty of pathos and poetry, and magnificent multiple-stopping for the solo instrument. This was a common part of the repertoire until his own second concerto supplanted it. Conventional only in its form, it is extremely innovative in its musical and technical materials, with a beautiful and heroic main theme. The second movement, a short Larghetto, is a simple yet exquisite musical prayer, demanding exquisite musical tone. The Rondo movement is an energetic movement, filled with extremely useful exercises in wrist movement and the martelé stroke. All in all, a majestic example of the Romantic concerto and a very valuable learning tool for the advancing player. Here, finally, in a brand new digital recording is this Romantic-era treasure, for your own discovery. Includes an authoritative, newly engraved music score printed on high-quality ivory paper; a digital stereo compact disc featuring a complete performance of the concerto with flute & guitar, and a second performance minus you, the flute soloist; and a second compact disc containing a full-speed version of the complete version as well as a special -20% slow-tempo version of the accompaniment for practice purposes. The concerto is indexed for your practice and performance convenience.